 Thank you to all those who participated in the Microsoft Graph Security Hackathon January 2019 Office Hours conference call! We had some great questions and discussions and here's a recap of the call. How can I get started? There are two options available to get started - use the demo data tenant or set your own tenant. Both these options are covered in the resources section. Ensure you set your permissions accordingly, as per guidance in this update, before requesting permissions to the demo tenant data. Regardless of any of these options you choose, please complete this short form to share your application ID with us for testing /judging purposes. You can switch between these options as well. Should my application just include Graph Security entities? The requirement for the submission is to use at least one Graph Security entity which are Alerts and/or Secure Score. That said, there is extra credit for including other Graph entities into the mix with Graph Security entities. You can also enrich your scenarios with other non-Microsoft technologies too! How can I get access to Microsoft Secure Score? If your tenant does not have access to Microsoft Secure Score, you can join the Office Developer Program and get access to the Developer Office Subscription for Office Secure Score. You can also subscribe to trial versions of Azure Security Center, Enterprise Mobillity and Windows Defender ATP trial versions to get access to Azure and Windows Secure Score. The links to these trial versions are listed under 'build your own data' option in resources. Which Operating System platforms is Microsoft Secure Score supported on? Secure Score reporting is from a Web client: security.microsoft.com or securescore.microsoft.com. Windows Defender ATP Secure Score only evaluates Windows security features, but both Office 365 and Azure Secure Score evaluate the cloud service security settings and is agnostic to the operating system. What are the video expectations for submissions? The video is expected to succintly (in ~ 5 minutes) capture the value proposition of your application and outline customer use cases and experience. Information on this is provided in the hackathon rules. How 'polished' or 'error free' should my submission be? All submissions will be equally weighted on three main criteria: quality of idea, value to enterprise and technical implementation as described in the judging criteria section in rules. Technical implementation criteria does include user experience, besides others, but then this is just one sub-item in the whole gamut of criteria. Hence, you can accordingly make a call on this. Remember, quality of the idea and value to the enterprise contributes to two-thirds of the score! How to engage if I have questions? If your question is generic, please post it on the dicsussions forum of this Hackathon. If your question is very specific and you are not comfortable asking it on the forums, please Email the hackathon manager. We will respond. How does this work if my application is on AWS? Graph authentication requires to have Azure Active Directory OAuth authentication for which you will need a service on Azure. Your application can be hosted on AWS though. You can use this application in Azure Active Directory to connect with AWS. Follow the steps in this tutorial to establish connection for this scenario. Can everyone see my submission? There are two types of projects on Devpost: Software project and Submissions. Every submission starts out as a software project from a technical standpoint. The software project creation asks for the project name, tagline, video, description, and try it out links. Only basic info is required. This software version is going to show up on your user portfolio. Once you submit it to a particular hackathon, it will take that software project and link it to the Hackathon. It will prompt you to answer the custom questions like your user name, phone number, country, and testing instructions. These fields are NOT shown publicly. Once you submit to the Hackathon, anything in those initial fields (project name, tagline, video, description) will be publicly visible on your portfolio to enable voting. Submission process is covered in DevPost help. Even after submitting your project you can continue to edit it till the Hackathon submission deadline. The next Office Hours conference call is on February 13, 2019 8 - 9 am PST. We'll publish conference call details few days before the call. Stay tuned!